Chili pepper fruits are washed, dried, and ground to produce this red, smoky spice. Paprika is a spice made from fruits (in the same family as red chili peppers) that are dried and ground into powders. 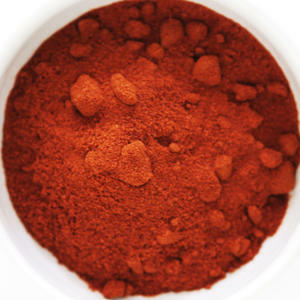 Paprika can be of different spiciness grades ranging from mild to hot. Paprika labeled “sweet” will not be spicy. Depending on the flavor you’re looking for, different paprika varieties can add heat or even smokiness. This spice can also lend color ranging from brown to rich red to a dish. Paprika is also packed with antioxidants and nutrients that have several health benefits. Even small amounts of paprika can provide you with a healthy dose of vitamins A, E, B-6, iron and capsaicin. Just one teaspoon has 37 percent of the daily recommended intake of vitamin A! These vitamins are crucial in preventing cellular damage and keeping your body functioning as it should. Capsaicin is the active ingredient in chili peppers that cause them to be spicy, and it has been shown to relax blood vessels and lower blood pressure. Capsaicin also has antibacterial and anti-inflammatory properties which makes it an ingredient often included in topical creams used for pain relief. Paprika is one of the most-widely consumed spices in the world and is featured in various cuisines.